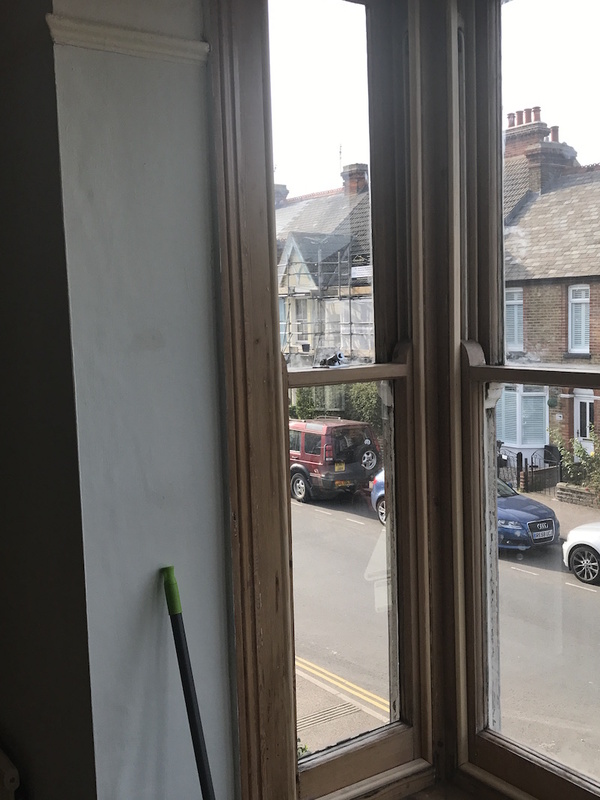 In this Crouch End and Holloway sash window case study we refurbished, draught proofed and re-glazed a four window bay of sash windows. The old glass was broken and had scratches from years of decorators catching the edge of the glazing whilst prepping. This is perfectly normal but really detracts from the aesthetics and it’s totally down to the homeowners preference as to wether we make the glass change. Certainly the panes of glass that were broken required replacement glazing and really were rattling and cold so a draught proofing system was a must. The refurbishment was quite unusual and interesting as the internal aspect had been stripped and stained which looked very nice. 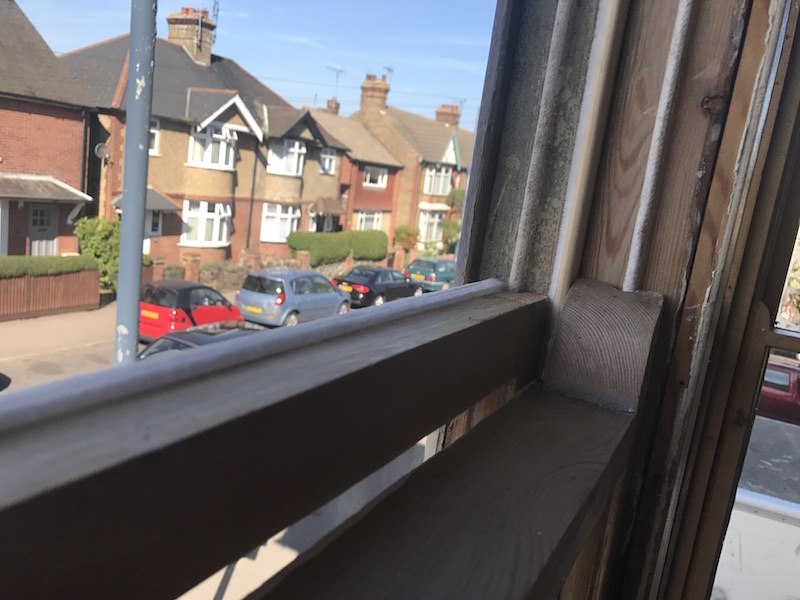 The homeowner asked for undecorated timber so that they may stain and match in the new timber with draught seals running through. Please note that this job is not double glazing of original sash windows. We do double glaze existing and original sash windows however this was’t required on this particular job. If you’d like to know about double glazed sash windows please visit the highlighted for further information. The first stages of sash window refurbishment is to mark up the sashes to note where machining is required. The meeting rails were uneven and required machining to bring them further into alignment once we put the windows back together. 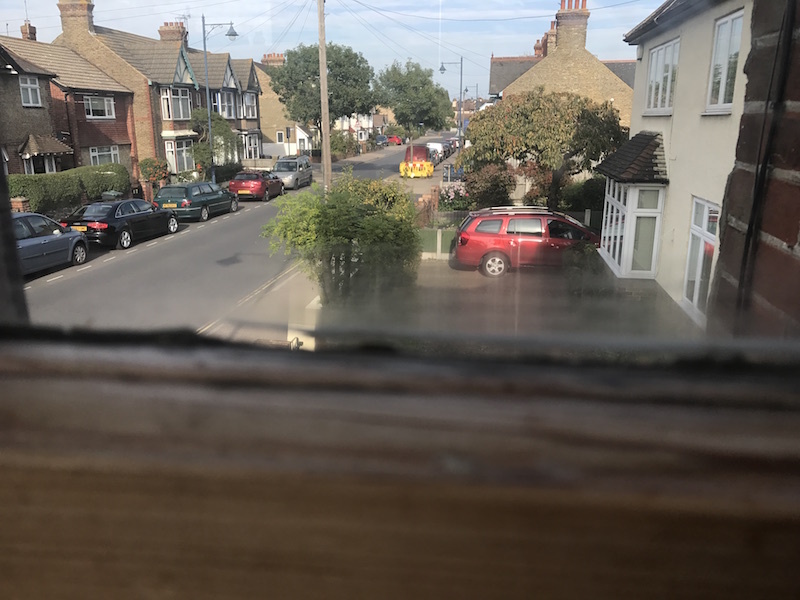 We also noted that the glazing was 3mm and we were replacing glass with 4mm so needed to compensate for this weight increase. We took the old sash out and then removed the old glass. We cut the loose and old putty away exposing the clean rebate. This is then checked for pins or rough surfaces that might cause the glass to break again. Once we are certain the surface is clear we bed the glass in on a couple of millimetres of putty in much the same way as the job was carried out a hundred years ago. The glass is then firmly secured with pins and face puttied. This leaves a clean looking sash that once decorated, you might be forgiven for not knowing the glass had ever been replaced. The picture below with the left hand sash is the original and you can still see a little black but the larger lower next to it looks much cleaner and better for the reglaze. With the glass in place we can now weigh the sashes ready for replacing the old sash cords. This is particularly important as we really need to get the weighting mechanism right. When a sash window is well balanced, it doesn’t drop and the travel is effortless. 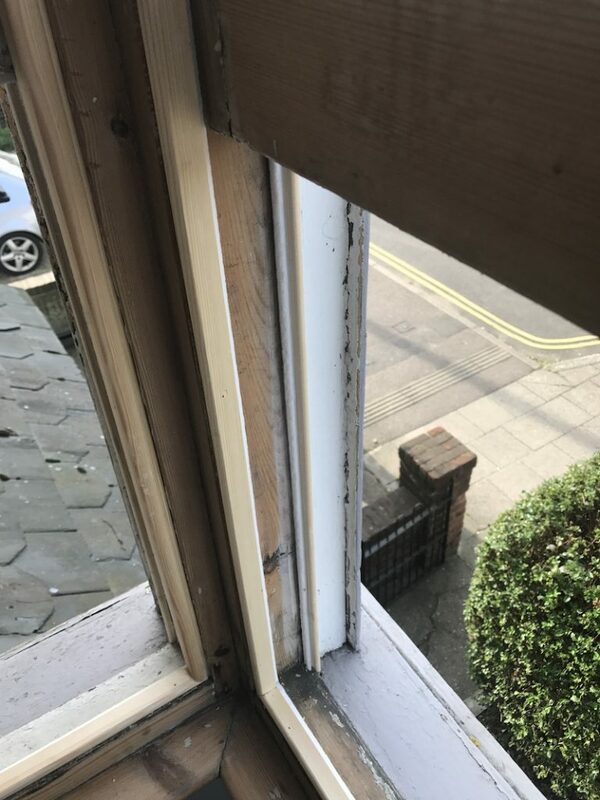 You may have had sash windows that drop when you open your catch – this is simply a case of the weight not quite being heavy enough to hold the sash to the top of the frame. With a couple of extra pounds of add weight this makes function that much more comfortable. The major benefit lay in the draught proofing is farm more effective when the sash closes neatly against the head of the window. If you take a look at the draught seal run across the top of the sash you can understand why it’s important the sash pulls neatly up to the head of the frame. This is the beginning of the draught proofing hidden and rebated within the sash. The next stage is to install draught proofing into the new parting bead timbers. This is a pre run groove that we then insert a brush pile carrier with seal slotted inside. Please take a look at how the draught proofing creates a seal against the the edge of the sash. At this point the top of the sash and the top sides are now draught proofed. The parting is then cut at the meeting rail and turned around so that the lower sash sits against the brush. This creates a seal against the lower sash and then we run a groove in the lower rail of the lower sash and the meeting rails of the lower sash to ensure a complete perimeter seal. With new cord and draught proofing all round the window is refurbished awaiting staining. 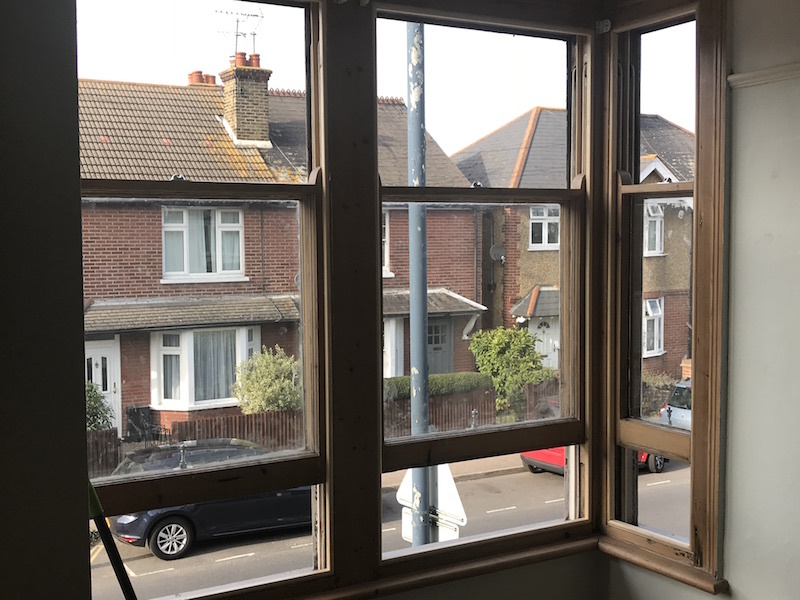 The last job is to fit nice new Satin furniture and then customer is in a position to stain the new timbers and this window will look stunning without decoration internally.